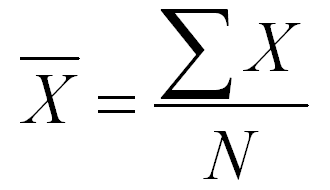 The sum of all the data points divided by the number of data points. ​​In our class, the formula we'll want to use is =AVERAGE(A1:A100). Replace A1:A100 with your data by highlighting the cells with data you want to include in the mean calculation. Be sure your mean has the correct number of digits. Your processed data should have the same number of digits as your raw data. So, in the example, the mean should be a whole number. To do this, click the box which is displaying the mean and on the "Home" tab click the decrease decimal button until you have the correct number of digits showing.